For other uses, see Watermelon (disambiguation). Watermelon (Citrullus lanatus) is a scrambling and trailing vine in the flowering plant family Cucurbitaceae. The species was long thought to have originated in southern Africa, but this was based on the erroneous synonymization by L. H. Bailey (1930) of a South African species with the cultivated watermelon. The error became apparent with DNA comparison of material of the cultivated watermelon seen and named by Linnaeus and the holotype of the South African species. There is evidence from seeds in Pharaoh tombs of watermelon cultivation in Ancient Egypt. Watermelon is grown in tropical and subtropical areas worldwide for its large edible fruit, also known as a watermelon, which is a special kind of berry with a hard rind and no internal division, botanically called a pepo. The sweet, juicy flesh is usually deep red to pink, with many black seeds, although seedless varieties have been cultivated. The fruit can be eaten raw or pickled and the rind is edible after cooking. Considerable breeding effort has been put into disease-resistant varieties. Many cultivars are available that produce mature fruit within 100 days of planting the crop. In Botswana, this is known as lerotse  and an ingredient in the local dish bogobe jwa lerotse. The sweet watermelon was formally described by Carl Linnaeus in 1753 and given the name Cucurbita citrullus. It was reassigned to the genus Citrullus in 1836 by the German botanist Heinrich Adolf Schrader. The watermelon is a flowering plant that originated in northeast Africa, where it is found growing wild. 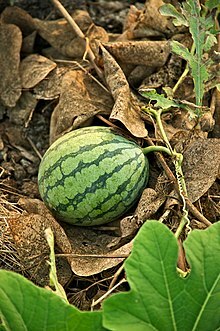 Citrullus colocynthis has sometimes been considered to be a wild ancestor of the watermelon; its native range extends from north and west Africa to west India. Watermelons are tropical or subtropical plants and need temperatures higher than about 25 °C (77 °F) to thrive. On a garden scale, seeds are usually sown in pots under cover and transplanted into well-drained sandy loam with a pH between 5.5 and 7, and medium levels of nitrogen. DNA data reveal that C. lanatus var. citroides Bailey is the same as Thunberg's bitter wooly melon, C. lanatus and also the same as C. amarus Schrad. It is not a form of the sweet watermelon C. vulgaris and not closely related to that species. C. caffer Schrad. is a synonym of C. amarus Schrad. Additionally, other wild species have bitter fruit containing cucurbitacin. C. colocynthis (L.) Schrad. ex Eckl. & Zeyh., C. rehmii De Winter, and C. naudinianus (Sond.) Hook.f. ^ "The Plant List: A Working List of All Plant Species". Retrieved 16 April 2014. ^ Bailey LH. 1930. Three discussions in Cucurbitaceae. Gentes Herbarum 2: 175–186. ^ Chomicki, G.; S. S. Renner (2014). "Watermelon origin solved with molecular phylogenetics including Linnaean material: Another example of museomics". New Phytologist. 205 (2): 526–32. doi: 10.1111/nph.13163. PMID 25358433. ^ Renner, S. S.; G. Chomicki & W. Greuter (2014). "Proposal to conserve the name Momordica lanata (Citrullus lanatus) (watermelon, Cucurbitaceae), with a conserved type, against Citrullus battich". Taxon. 63 (4): 941–942. doi: 10.12705/634.29. ^ Parsons, William Thomas; Cuthbertson, Eric George (2001). Noxious Weeds of Australia (2nd ed.). Collingwood, Victoria: CSIRO Publishing. pp. 407–408. ISBN 978-0643065147. Retrieved 17 April 2014. ^ L. H. Bailey, Three discussions in Cucurbitaceae (1930) Gentes Herbarum 2: 175–186. ^ S. S. Renner and G. Chomicki,Watermelon origin solved with molecular phylogenetics including Linnaean material: Another example of museomics (2017) New Phytologist 205: 526–532. ^ "Production guide_bitter water melon.indd" (PDF). Retrieved 10 August 2018. ^ a b "Brochure: Bitter watermelon - Department of Agriculture" (PDF). Republic of South Africa Department: Agriculture, Forestry and Fisheries. Retrieved 19 May 2016. ^ a b c d e "Threatened Species Programme | SANBI Red List of South African Plants". redlist.sanbi.org. Retrieved 19 May 2016. ^ a b c d e f g "Citrullus lanatus (Thunb.) Matsum. & Nakai". South Africa National Biodiversity Institute. Retrieved 17 October 2013. ^ "A Systematic Treatment of Fruit Types". Worldbotanical.com. Retrieved 7 October 2014. ^ a b c d e f Maynard, David; Maynard, Donald N. (2012). 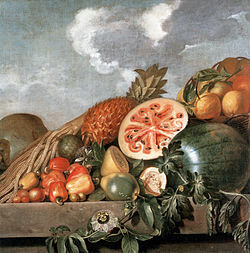 "6: Cucumbers, melons and watermelons". In Kiple, Kenneth F.; Ornelas, Kriemhild Coneè (eds.). The Cambridge World History of Food, Part 2. Medical History. 46. Cambridge University Press. pp. 267–270. doi: 10.1017/CHOL9780521402156. ISBN 978-0-521-40215-6. PMC 1044500. PMID 16562324. ^ a b c d e "Citrullus lanatus (Thunb.) Matsum. & Nakai". South Africa National Biodiversity Institute. Retrieved 4 October 2014. ^ "Momordica lanata Thunb". Australian Plant Name Index (APNI), IBIS database. Centre for Plant Biodiversity Research, Australian Government, Canberra. Retrieved 17 October 2013. ^ "Citrullus lanatus (Thunb.) Matsum. & Nakai". Australian Plant Name Index (APNI), IBIS database. Centre for Plant Biodiversity Research, Australian Government, Canberra. Retrieved 17 October 2013. ^ Renner, S. S., A. Sousa, and G. Chomicki. 2017. Chromosome numbers, Sudanese wild forms, and classification of the watermelon genus Citrullus, with 50 names allocated to seven biological species. Taxon 66(6): 1393-1405. ^ Zohary, Daniel and Hopf, Maria (2000) Domestication of Plants in the Old World, third edition, Oxford University Press, p. 193, ISBN 0-19-850357-1. ^ "Production of Seedless Watermelons". US Department of Agriculture. 15 June 1971. Retrieved 31 May 2017. ^ Naeve, Linda (December 2015). "Watermelon". agmrc.org. Agricultural Marketing Resource Center. Retrieved 31 May 2017. ^ a b "Watermelon Variety Descriptions". Washington State University. Retrieved 2 October 2014. ^ a b "Square fruit stuns Japanese shoppers". BBC News. 15 June 2001. ^ "Square watermelons Japan. English version". YouTube. 6 November 2013. Retrieved 3 August 2014. ^ a b c Porcher, Michel H. "Multilingual Multiscript Plant Name Database". Sorting Citrullus names. Retrieved 17 October 2013. ^ "Citrullus lanatus (watermelon)". Royal Botanic Gardens (Kew). Retrieved 17 October 2013. ^ "Vegetable Research & Extension Center – Icebox Watermelons". Retrieved 2 August 2008. ^ a b "Heaviest watermelon". Guinness World Records. Retrieved 2 July 2015. ^ "Watermelon growing contest". Georgia 4H. The University of Georgia College of Agricultural and Environmental Sciences. 2005. Retrieved 5 October 2014. ^ "Golden Midget Watermelon". Archived from the original on 11 October 2007. Retrieved 5 October 2014. ^ "Orangeglo Watermelon". Archived from the original on 27 September 2007. Retrieved 23 April 2007. ^ "Moon and Stars Watermelon Heirloom". rareseeds.com. Archived from the original on 17 December 2007. Retrieved 15 July 2008. ^ Evans, Lynette (15 July 2005). "Moon & Stars watermelon (Citrullus lanatus) — Seed-spittin' melons makin' a comeback". The San Francisco Chronicle. Archived from the original on 13 October 2007. Retrieved 6 July 2007. ^ "Moon and Stars Watermelon". Archived from the original on 2 June 2007. Retrieved 23 April 2007. ^ "Watermelon, Cream Saskatchewan". seedsavers.org. Archived from the original on 21 February 2009. ^ "Melitopolski Watermelon". Archived from the original on 27 September 2007. Retrieved 23 April 2007. ^ Hosaka, Tomoko A. (6 June 2008). "Black Japanese watermelon sold at record price". The Associated Pres. Archived from the original on 9 June 2008. Retrieved 10 June 2008. ^ a b Todd C. Wehner (2008). "12. Watermelon". In Jaime Prohens and Fernando Nuez (ed.). Handbook of plant breeding. Volume 1, Vegetables. I, Asteraceae, Brassicaceae, Chenopodicaceae, and Cucurbitaceae. Handbook of Plant Breeding. 1. Springer. pp. 381–418. doi: 10.1007/978-0-387-30443-4_12. ISBN 978-0-387-72291-7. ^ "Good reasons for icebox melons". The Free Library. Sunset. 1 May 1985. Retrieved 4 October 2014. ^ a b c "Watermelon production in 2016; Crops/Regions (World list)/Production quantity (from pick lists)". Food and Agriculture Organization of the United Nations, Statistics Division (FAOSTAT). 2018. Retrieved 10 February 2018. ^ "Watermelon". g Marketing Resource Center, US Department of Agriculture, Iowa State University. 2017. Retrieved 9 May 2017. ^ "Top 10 ways to enjoy watermelon". Produce for Better Health Foundation, Centers for Disease Control, US National Institutes of Health. 2017. Retrieved 9 May 2017. ^ Ogodo, A. C.; Ugbogu, O. C.; Ugbogu, A. E.; Ezeonu, C. S. (2015). "Production of mixed fruit (pawpaw, banana and watermelon) wine using Saccharomyces cerevisiae isolated from palm wine". SpringerPlus. 4: 683. doi: 10.1186/s40064-015-1475-8. PMC 4639538. PMID 26576326. ^ Shiu-ying Hu (2005). Food Plants of China. Chinese University Press. p. 125. ISBN 978-962-996-229-6. ^ Bryant Terry (2009). Vegan Soul Kitchen: Fresh, Healthy, and Creative African-American Cuisine. Da Capo Press. p. 46. ISBN 978-0-7867-4503-6. ^ "Oklahoma Declares Watermelon Its State Vegetable". CBS4denver. 18 April 2007. Archived from the original on 2 March 2008. Retrieved 3 October 2009. ^ "Watermelon, raw". Nutritional data. Self. Retrieved 5 October 2014. ^ The Associated Press (3 July 2008). "CBC News – Health – Watermelon the real passion fruit?". CBC. Retrieved 3 August 2014. Wikimedia Commons has media related to Citrullus lanatus.